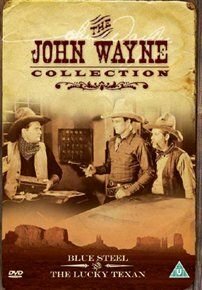 Two classic westerns starring John Wayne. In 'Blue Steel' (1934) a town is held to ransom by a band of outlaws when gold is discovered. All looks grim until Wayne comes on the scene and stands up to them. With George 'Gabby' Hayes and Eleanor Hunt. In 'The Lucky Texan' (1934) Wayne stars as Jerry Mason, a young Texan who becomes partners with an old rancher, Jake Benson (Hayes), and they strike it rich with a gold mine. Their lives become complicated when they attract the attention of the bad guys and a woman (Barbara Sheldon).